Garden season is around the corner and there’s no better way to usher in the warm weather than by choosing which heirloom and organic peppers to plant in your garden. To help you decide, we made this list of our favorite hot peppers. Some are so hot, they sizzle! Post in the comments below to let us—and everyone else—know your favorite way to prepare peppers. In a salsa, perhaps? Pickled? Or maybe just raw and dipped in hummus? Sizzling hot!- These bright, golden orange fruits have few seeds and a citrus-y flavor that’s sizzling hot. At Seed Savers, it doesn't get any hotter than this! Sizzling hot!- Also known as Lucifer’s Dream, this variety produces huge numbers of rippled-flesh peppers. They have a fruity flavor while still being way hotter than jalapenos! Very hot- This pepper variety isn't only spectacularly hot, it is also incredibly beautiful. They start out green and tinged with purple then ripen to a mustard-y orange and finally bright orange. Very hot- This variety has a bright, golden, peach-colored flesh and is a favorite variety for container growing. Very hot- Don’t let these adorable clusters of barely-an-inch-wide fruits fool you, they give off serious heat. This productive heirloom pepper grows in bundles, ripening from green to red, and is recommended for pickling or salsas. Hot- These hot heirloom peppers grow to be only about three inches long but they still pack a punch! They ripen from green to red. 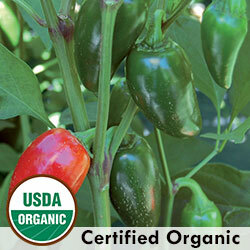 Hot- These bright red, red-hot peppers are the width of your finger but grow to a foot long. They’re recommended for fresh eating or drying, which ever you prefer. Hot- With flame in its name you won’t be surprised that this heirloom variety brings the heat. Its crunchy flesh makes for a sensational salsa. Hot- This heirloom’s name does all the talking for it. These fruits grow to be half an inch in length, but you’ll grow about 200 per plant. Hot- A perfect choice to dry and use for seasoning, these tiny organic peppers are a spectacular sight when they ripen from green to bright orange. Browse all 60 pepper varieties from our catalog. Green Thumb Tips: Here at Seed Savers we recommend sowing seeds indoors 8 weeks before the last frost. Plant ¼” deep and seeds will germinate in 14 days. They germinate best in warm soil, so gentle bottom heat may be helpful until seedlings emerge. Transplant outdoors 12-24” apart when soil is warm. Peppers prefer full sun. Anyone can shop our seeds, but when you become a valued memberof Seed Savers Exchange you can receive 10% off your purchases from our catalog and online store. You’ll also have access to thousands more heirloom and organic vegetable, flower, and herb seeds offered by other members in the seed exchange. We invite you to browse the peppers and many more heirloom and organic seed varieties at our Online Seed Exchange.